Your wedding should be a day filled with love and cherished memories, not stress and last minute changes. Avoid the stress and treat yourself to the wedding of your dreams here in sunny Myrtle Beach, South Carolina. Whether you live here in Myrtle Beach or you’re looking for the perfect place to have your wedding, we can’t wait to help you plan the most magical day of your life! When you plan your wedding at Marina Inn, you can make your special day even more special. Start your wedding off on the right foot with the rehearsal dinner! With two separate dining packages to pick from, you can’t go wrong. The Plated Rehearsal Dinner comes with your choice of the main entree, salad, and dessert. Your guests will struggle to choose between tasty options such as roasted free range chicken, grilled sirloin filet, low country filet with shrimp, and wild caught salmon. If your family loves to eat, our Rehearsal Buffet Dinner package is perfect for you. With a variety of different salad, entree, side, and dessert options to choose from, this rehearsal dinner will be both memorable and delicious. With a variety of venue options, you can have the indoor or outdoor wedding you’ve always dreamed of. With venues able to accommodate up to 700 people, your wedding can be as private and intimate as you like or you can invite the entire town. You can enjoy the stunning view of the waterway with our outdoor Grande Lawn venue. This venue can give you the elegant wedding you’ve always wanted while accommodating up to 400 people. If you’re worried about the weather literally raining on your parade, this area can be tented if need be. Take your outdoor wedding to the next level with our Compass Pad venue. This intimate area offers you a breathtaking panoramic view of the marina and golf course. This stunning option is perfect for both small weddings or receptions of up to 50 people. If your dream wedding doesn’t involve being outdoors under the Myrtle Beach sunshine, no need to worry. With multiple indoor options, we can make your dream wedding happen anywhere on property. Watch our Nautilus Ballroom or Coral Room transform transform into the venue of your dreams. After you say “I do” to the love of your life, say “I do” to the best food of your life! With our wedding reception catering packages, you can start off the rest of your life together with a bang! All wedding reception packages include: use of our elegant Nautilus Ballroom, complimentary bridal suite on the wedding night, special rates for friends and family, and so much more. Your guests will thank you no matter which dining package you choose: the Grande Heavy hors d’oeuvres package, Grande Plated Dinner, or the Grande Buffet Dinner. Whether you’re nibbling on hors d’oeuvres or dining on a two-course meal, make sure to take advantage of our Grande Bar Selections. Enjoy a simple glass of wine with dinner or enjoy an open bar throughout the reception. With our Deluxe Bar Package, you and your guests can sip on top brands while you celebrate. If you want to keep it simple, you’ll enjoy our Beer and Wine Bar Package, where you can enjoy unlimited domestic and international beers, house wines, and soft drinks. No matter what or how much you’re wanting to drink, we’ve got the right package for you. Save yourself the headache of trying to coordinate your wedding schedule with your honeymoon travels. Unwind and kick off married life under the sun right here in Myrtle Beach! With two honeymoon packages to choose from, you and your beloved can start off your eternity together with a honeymoon filled with romance, luxury, and intimacy. Start off your forever together the right way our Classic Myrtle Beach Honeymoon package. You can unwind from the stress of wedding planning in the room of your choice and enjoy luxuries such as a terrace with a view, cotton bathrobes, Egyptian cotton linens and down pillows. You can toast to your nuptials after your bottle of Domaine Ste. Michelle sparkling wine is delivered to your room after check-in along with chocolate covered strawberries. During your honeymoon, you can also enjoy fine dining every morning for breakfast at our on-site restaurant, Waterscapes, along with enjoying a three-course dinner for two. The Grande Honeymoon Experience has everything you need for the perfect beginning to your marriage. Enjoy your honeymoon in the room of your choice, and with all of our luxurious options, you can’t make the wrong choice. You can enjoy a terrace with a stunning view, two cotton bathrobes, Egyptian cotton bed linens and so much more. After you check-in and get comfy in your room, you can expect a delivery of Domaine Ste. 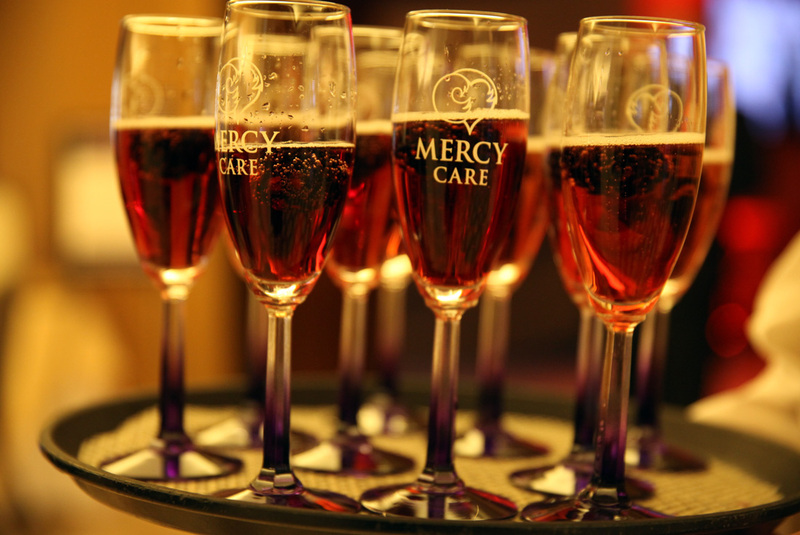 Michelle sparkling wine plus chocolate covered strawberries right to your door. 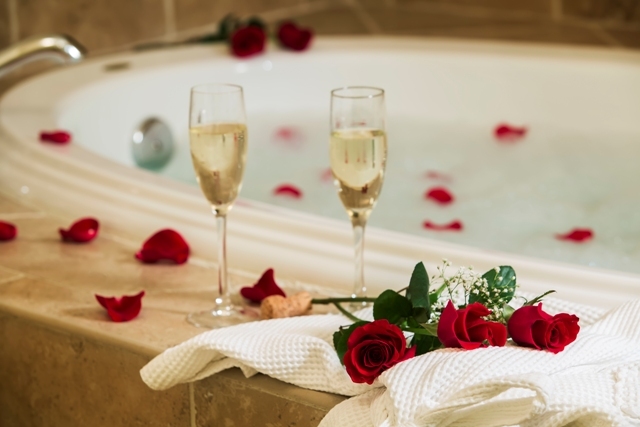 With our Grande Honeymoon Experience package, you can enjoy some much needed R&R with breakfast in bed each morning along with a one hour couples hot stone massage within the privacy of your room. Once you’re finally able to drag yourself from the comfort of your room, you can enjoy a romantic dinner for two at our award-winning restaurant, WaterScapes. Your second night will be even sweeter with a complimentary Chocolate Decadence for Two delivered right to your room. Your special day should be just that: special. With a multitude of wedding packages to choose from, you’ll never have to settle for anything less than the wedding of your dreams at Marina Inn. Let Us Tell Your Unforgettable Wedding Story! It’s a day most women have been dreaming about their whole lives – the day they get to walk down the aisle and say “I do” and marry the man of their dreams. Not only is Myrtle Beach an ideal location to celebrate your nuptials, but the AAA four-diamond Marina Inn at Grande Dunes can tell your special Myrtle Beach wedding story with our unique boutique venue, outstanding service and amenities unlike any other wedding venue in Myrtle Beach! What our Guests Are Saying About their Wedding at Marina Inn! Begin with an Enchanting Ceremony….. Here at Marina Inn we offer a complete wedding package that makes it easy to turn your dream wedding into a reality. Everything from the ceremony to the reception, we have plenty of options to customize and make your day as enchanting as you’ve imagined. 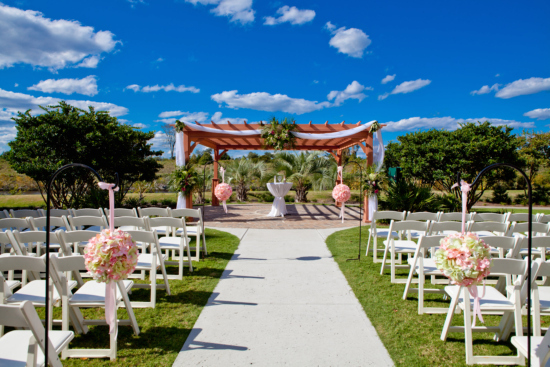 Whether you desire to exchange vows indoors or outdoors, we have options for both. For outdoor weddings in Myrtle Beach, Our Grande Lawn is an enchanting space with a wood pergola that can be lavishly decorated for the ceremony. The beautiful green manicured grass of the lawn can accommodate seating up to 300. All of this with a serene background overlooking the green manicured fairways of the Resort Course at Grande Dunes. Sunsets over the golf course and waterway are breathtaking and will make for some unforgettable wedding photos. If an outdoor ceremony is not your style, our Nautilus Ballroom is equally as captivating with towering taupe Corinthian columns and old world sparkling chandeliers hanging from 18′ tall ceilings surrounded by Tuscan inspired decor. Following the official “I do” it’s celebration time and depending on the size of your wedding wedding party, there are a variety of inspiring spaces inspired by Tuscan design with tall floor to ceiling columns, old world chandeliers and floor to ceiling windows overlooking the Grande Lawn. For smaller receptions of 60 or less, the Outdoor Loggia that, although is outdoors, is completely covered. This space can also be be paired with the indoor Pre-Function Area to add an open-air element to your indoor/outdoor reception. The Pre-Function Area and Loggia combined 4,000 square feet can accommodates up to 200 guests. The Pre-Function Area and Outdoor Loggia are also both excellent places to host your rehearsal dinner. 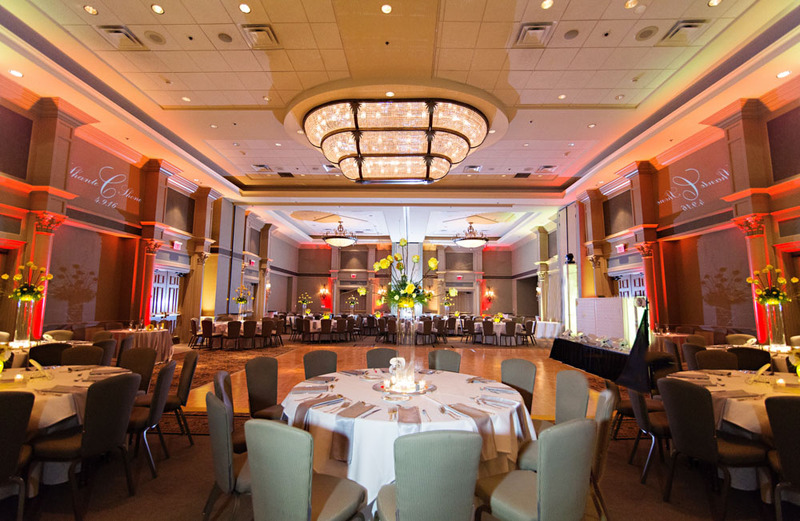 For large weddings of up to 350, the Nautilus Ballroom is the perfect location. It is 5,000 square feet of pure elegance. This space can be paired with the Pre-Function Area to host reception/bar in Pre-Function and dinner/entertainment in the Nautilus Ballroom. Even though the beauty of the space alone really does not require much decorating; if you want to go all out, decorating options are endless! We have had decorating themes that range from “Frozen” to “Travel the World” However you wish to decorate or not, your guests have plenty of space to both mix and mingle, dine and dance the night away. See the Magic of a Marina Inn Wedding…. When you book your wedding at Marina Inn, you won’t have to worry about guest parking. We offer valet parking for $12 or free self-parking, depending on what your guests prefer. Either way, all parking is located conveniently on-site. Whether you are looking at a full sit down 3, 4 or 5 course dinner or a heavy hor d’oeuvre reception, we offer a variety of menu options carefully created by our culinary team with every budget in mind. However, if you are looking for something other than what is included in our menus, just ask your sales representative and our catering team will price it for you. Our award-winning culinary team is sure to prepare a meal that will not only satisfy your guests but one that will be fondly remembered by all. Don’t Get Bogged Down with Details…Hire a Professional Wedding Planner! Wedding planning can make your dream wedding seem like a nightmare without the proper resources and advice! The Marina Inn at Grande Dunes catering sales team will assist with securing the right space for your wedding events such as the ceremony and reception as well as assist with choosing menus for your event and securing a guest room block for your wedding party. However, garnering advice and logistics from a professional wedding planner is invaluable! We work with some of the top wedding professionals in the Myrtle Beach industry that can create an event based on your specific style and budget that work with the most respected wedding vendors in Myrtle Beach to make sure your wedding is flawless! Marina Inn Grande Dunes is thrilled about the potential to be your wedding day destination. We are eager to do answer your questions. If you plan on getting married this year, we are featuring 2017 Value Package Dates with special incentives! Learn More!